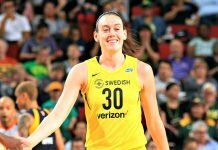 Arlington, Texas – Breanna Stewart scored a season-high 30 points to lead the Seattle Storm past the Dallas Wings Saturday, 89-69. The win snapped a three-game losing streak for the Storm, and ended a four-game winning streak for the Wings. Stewart also grabbed 10 rebounds, as Seattle shot 57 percent. 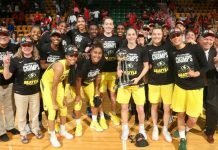 Crystal Langhorne added 19 points and Sue Bird had 12 points and eight assists for 2,506 in her career – second all-time now to Ticha Penicheiro. The Storm, now 7-8, has struggled after beginning the season 4-1. Stewart said this win was the kind of game they’d been working toward. Bird said there was no different in how she felt after reaching the assists milestone, but it is something she can take pride in down the road. The Storm showed up defensively by not giving up the three to the Wings as they went 1-17 and shot just 35 percent from the floor. Glory Johnson led Dallas with 18 points and 10 rebounds, while Allisha Gray scored 15 points and Skylar Diggins-Smith added 13. Assistant coach Bridget Pettis assumed head coaching duties for the second time as Dallas coach Fred Williams was out due to an undisclosed illness. The Wings beat the hot-handed Connecticut Sun last weekend, but hadn’t played since then. Pettis said this may have hindered them in the Seattle match up..
Dallas missed switches on defense and missed open looks, including a few layups. Pettis said this was due to lack of effort and team discipline.